I am amazed how good is this app. It’s really worth the prize and the UI is simple and intuitive. Also works well with old iPads. I’ve been using this app since 2012. It has a lot of great functionality, but it has been buggy since day one. I can’t count the number of times it has randomly crashed and I lost hours of work. I wouldn’t mind the constant crashes if it would save your work every 5-10 minutes automatically. Other than the crashes it functions as advertised. But you’d think they could solve this after 6 years of owning this app on 3 different iPads. My only complaint is the yellow and blue don’t make green and instead make a grayish-purplish color. I’ve been using this app for a little while now and it works pretty well but recently I’ve had crashing problems, and have lost some work because of it. I’d really like to continue using this app because I’m use to it but it’s not great that I keep loosing some of my work. I found out about this app a few hours ago, and it’s so addicting! I love to draw, and this app is another great way to draw or paint! I suggest this app to any who love to draw! I love using it and have never had it crash actually, I draw my cartoony characters and love adding textures and blending. Easy to use and really just an amazing app! This app is phenomenal. The only thing that should be added is a selection option to the pencil only. Repositioning a stroke of paint or two that you don’t necessarily want to erase or paint over would indeed compromise what this app embodies as a digital version of traditional painting. Although I’ve only been using it for just a few month, I feel that it is revolutionary in that of its predecessors and will always be used in my arsenal of mediums. Well done Ambient Design Ltd.!!! All important functions such as export and rotate are broken! Please fix! I love this app. It helps me stay calm and at peace day to day. The only thing I have an issue with is the zooming. At times it is not responsive and when I want to zoom into my drawing, it will leave giant blotches of ink or paint on my art that I then have to remove. Every. Time. Please, fix this issue so the app can run smoothly across the board. Cons: * There’re no opacity and thickness sliders on the screen - you have to go into menu. Thickness is visible in left corner but also 2 clicks away. It’s much better to change it via menu because if you don’t do it properly on the corner selection it pops up a numeric box where you type the thickness with the keyboard. Seriously, a keyboard? There’s a “Metal” slider on the right working smoothly and always visible. Is it more useful than thickness and opacity? (rhetorical question) * In fact there’s no opacity at all! So when you mix colors you can’t mix-in more of the color you’re adding. This makes the app essentially useless to me because it’s much less controlled with regards to the color you’ll get. * Also, the brush maximum thickness is not so thick. 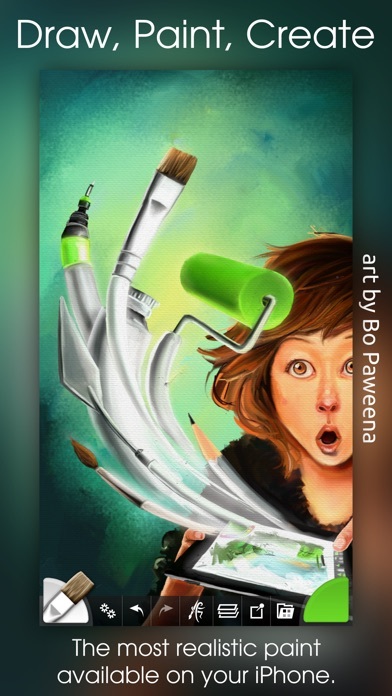 * Though the app looks like a desktop program, the brushes engine is less powerful than on the desktop. Oil paint texture is less pronounced than on desktop. You’re getting a different app that just happens to share the same name as the awesome ArtRage desktop version. Pros: * One really. I like the way paints interact when mixing. They’re not realistic as the desktop ArtRage (so you won’t get yellow + blue = green) And you can’t control how much paint you put in using a brush (no opacity) making color somewhat a random thing. But even with that said it still delivers interesting mixing feel that’s not available in Procreate (which is vastly superior in just about every other way) In all the apps I’ve tried they seem to aim to do the same thing, and Procreate does that thing the best. But ArtRage is different in a way it does the paint mixing differently, giving it more “paint” characteristic than it’s more “digital” counterparts. If the app is completely redesigned keeping in tune with Touch rather than Desktop UI practices. If opacity is added to the app, and also made available as sliders along with thickness. Then the app would be an instant 5-star, even if the desktop brush engine was more powerful. Seriously looks gross on a regular iPad. I drew #4 great drawing. I was really impressed!!! Then my Apple Pencil began to lag. Really bad & I couldn’t draw accurately. It wasn’t the pencil; it worked accurately on other drawing apps. Please fix!!! The fun of real paint without the mess! Or the expense. Being able to just squirt paint onto the canvas and smoosh it around is great fun. My only complaint it that the rounds do not seem to behave exactly as a round should at the end of a stroke. There is not enough tapering off, especially for those who would shape their brushes especially for that purpose. I have fiddled with the settings and cannot seem to do fix this. Do not buy this app in its current state! It will crash often without warning, destroying all traces of any work you’ve done. There is no excuse, given the power of modern iPads, for this app to be missing real media, color-blending. In addition, I find the maximum size of brushes too small which results in time wasted. I love this app. The pallet knife really makes some interesting effects ,I like it with the oil paint and canvas texture also. 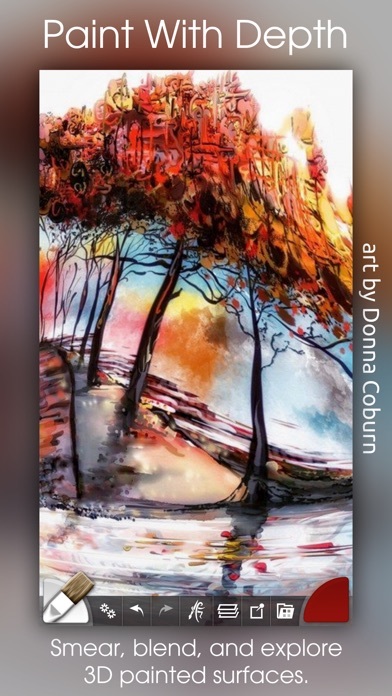 I have done a few paintings that looked like traditional mediums with this app but haven’t been able to get them types of effects with any other programs or apps. For what I’m doing this works very well. I have had issues with ArtRage not functioning properly on my devices in the past, both my iPhones and iPads. But, I have to say that the app works brilliantly now for me. And I just want to extend my sincere thanks and gratitude to the developers for all of the hard work, time and effort that they no doubt have put into making this app work so well. Everything just works and functions so smoothly for me, the painting engine runs beautifully I think, the options for brushes and tools all work well, just everything in my opinion is perfect as I said. I can now add this app again to my daily programs that I use for painting. Which makes me so happy because I always adored ArtRage on my Mac desktop computers and now I can enjoy it close to the same on my mobile devices. Though, if I'm being honest, I do wish that the mobile version had more tools similar to the desktop computer application. I know it's probably not easy at all to try and make them identical. But, I feel it's been a super long time since any new tools or brushes were added to these mobile versions of ArtRage. I would absolutely love it and appreciate it if the developers would please add more brushes and tools to these mobile versions. I've been using the same brushes for so long and I really would love it if we could have some new ones please. And also I think it would be great if we could download presets, like official and user ones for that one tool like you can on the desktop version of ArtRage please. Thank you if you'll consider that and thanks again for making this app work so well and all of the hard work I'm sure you put into it and God bless. The only art app I have found on the App Store with metallic paint as an option. For that reason, ArtRage is the only app I kept of all the ones I tried. By far my favorite sketch app. I know there are some shortfalls, but overall I find it fantastic. Have been using it for a couple years now. Not sure why other review says bad for cartoons...I think it would be great. I use it for children's art I sell on Etsy, and to design tattoo work, and any time I need quick sketches. Some are quite complex. Good layering, the only thing I find lacking is the cut and paste. This is a really great art app and I use it a lot. After the newest update, I noticed a glitch. If you try to change the opacity of a layer, the app will crash and delete anything that wasn't saved. This needs to get fixed soon. Other than that, I haven't found anything wrong with the app. Nice oil simulation. Great features overall. Re-review. I have about 8 different art apps for the iPad. This is currently my favorite. It's kind of a battery hog, and requires some CPU power. But, on the iPad Pro, it works great. Best features: layers, simulated oils, color blending, image import / tracing, lots of tools. Wish list: color picker using tracing layer, palette board, customizable quick tools. The oil simulation is my favorite feature. But, why can't I easily mix the paints together and create a palette for my brush? It'd be awesome if it was a full oil simulator. And, I also love that I can pin up a reference image. I don't like just tracing. Okay, so I tried out this app for about a few months now, and I'll say I like it! You can definitely make realistic masterpieces that might be confused for real life paintings scanned onto your iPad. However, if you are a cartoonist and draw non-realistic art, DO NOT buy this app. Other than that, I like this app. Waste of money. Way less functionality than most other apps out there. My fave art app! Five stars! For 4.99 USD is a deal. Addictive. Easy. Hours of imagination. Cool tools and brushes. 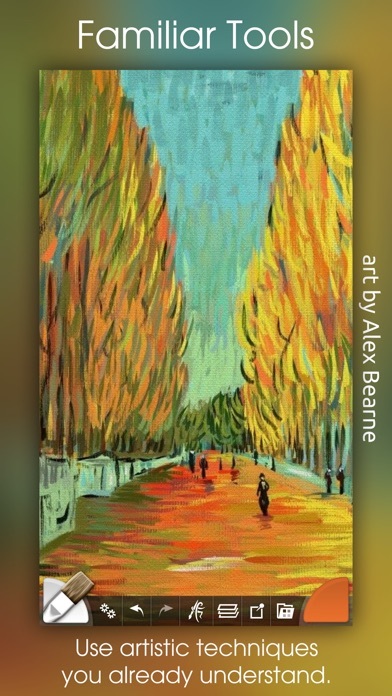 The best art app I've found that does so many things. "Must have" for all levels of artists. Disappointed to find ArtRage app has no cloning tool. All this needs is a tiny bit more evolution with emphasis on bettering their already shining oil paint brush and blending and this app would be even better than it is currently. I've been using this app for a couple of years now. It's terrific! I've tried others, and keep trying all the new ones as they come out, but I always come back to this. I'm glad I didn't pay much for the app. The ability to zoom and get detailed is limited. There is no option to choose acrylic paint. I have free art apps that deliver more than this app. Incredible paint app highly recommended!!! I have never experienced such lag in anything I do on my new Pro or my older IPad Pro 12.9". I'm not the only one as many on the Facebook sight I post digital art work to are also having same problem. What is going on? Phrase fix! I really enjoy using the Art Rage program on my computer. This looks familiar, but the graphics are nowhere near the desktop version. It's not as good as other art apps I've tried. I'm annoyed I spent the money on this! Has issues with simple features such as locking an object in place. Had high hopes for this as I saw a demo and appeared better than its competitors out there...hopefully improvements are made to fix those issues. It's a pretty good drawing app. Very responsive with my pro and pencil. And there are many tools to choose from. You can make layers and even trace pictures. The only issue I have is that the strokes on some of the tools come out VERY pixelated. Once I got familiar with them and used some blurring and adjustments on the tools I was able to work with it, but I do hope that in future updates the lines become smoother. All in all I like this app and I like what it lets me create. 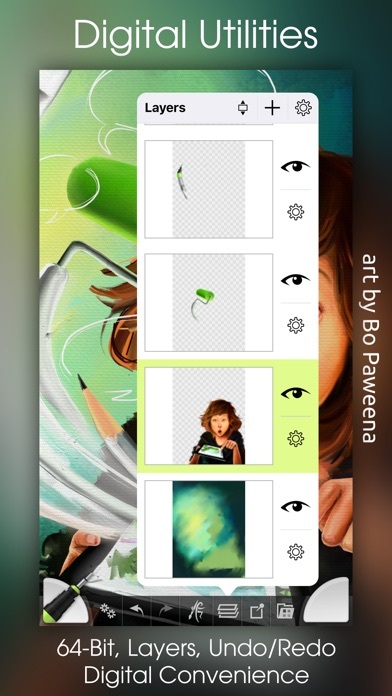 When i try to change the size on the brushes, the app crashes. Everything else is just as cool as the artrage program on my computer. I haven't been able to try out this app yet, even though I bought it and downloaded it. Why? Because it crashes on the open screen. My iPad meets the spec requirements, but the program CRASHES before passing the open screen. Total fail. Amazing App! Needs stylus update for the new Wacom Bamboo Sketch stylus, please! New Wacom Bamboo Sketch stylus for iPad/iPad Pro not working well with my iPad Pro and ArtRage. Needs a Wacom stylus driver update, please. Please fix. I've been using this app for about a year, and I haven't experienced any crashes or loss of work. The brushes are kind of limited, but you do get layers, you can change pencil pressure, and you can add trace or reference images. It's very good for the price. I use the apple pencil and it responds very well. I'd recommend to anyone who wants to work digitally but can't afford or isn't ready for sai paint tool or photoshop etc. I'd love to have steciling for my art class right now. I didn't realize the iPad Pro to have the limitations it does. I really need basic shapes. Procreate is a much better option for serious artists and for casual sketching and ideas, I like Paper by 53. This one doesn't even break the top 3 for me. It was once the best, but now there is a lot more competition. Already deleted it. It's great seriously same as the pc version pretty much love it like to play around with different mediums all the time. The painting works nicely. 3D Touch allows varying width of lines. I like how I can doodle with a real pen, take a picture, and set it as a multiply layer and start coloring. I have an iPhone 8 with big text setting, and the color picker got cut off a bit on the left. 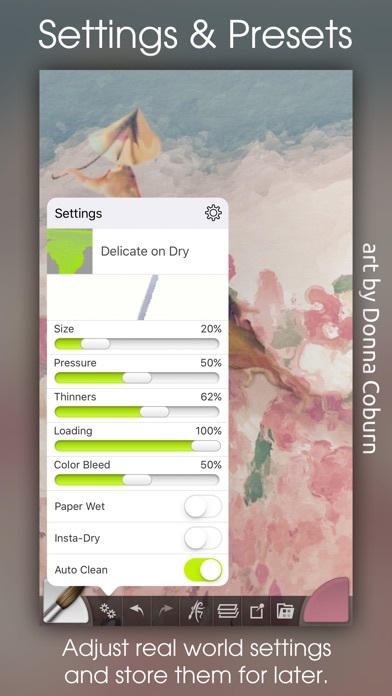 The “ArtRage” menu fills the screen completely, and the cancel button is obscured by the “preference” button. I’ve been using this app for years and have always loved it! Now I can’t draw a line without it crashing and reverting to the last save! Not enough time to save again before it crashes! So upset... please fix this so I can continue to use one of my favorite apps! Does a great job, a lot of fun, but you had better save every time you finish a little work. It crashes often and will restart with your last save. UPDATE 1-25-2018 -- After playing around I found if I highlight the original lineart then go to multiply then duplicate the original lineart and put a new layer BETWEEN the copy and the original. I can now color without worries. I also got an email from the developer. The original PNG lineart background must be transparent without having to do multiply and duplicate. I'm raising the stars to 5 again. Thank you ArtRage developer! I've been using ArtRage program on my PC since 2008 and ArtRage app on my iPad Mini since 2016 and mostly recently on my Chromebook in Jan. 2018. Now, this is a very serious for me. A few days ago I uploaded a fellow artist's lineart on my iPad. Once I have the lineart, I'd add another layer to color which is on top of the lineart layer. I can color BUT I didn't want color the lines so I moved that layer below the lineart. Guess what? There's nothing there. When I checked my layers you can see the color in the colored layer but not the main window. I've done this so many times and I never had this problem before. I love this app but I might not use it at all because of this. My app is up to date. Am I the only who is having this problem? Lots of great stuff to love about this app. Layers, ability to trace imported photos, multitude of brush options. Sadly, app is hardly usable as it is constantly crashing. I use 2nd gen 12.9 iPad Pro with Apple Pencil . Please, please fix crashing. Also, pleas add iCloud support for files.